The Compatibility Checker identifies the potential loss of functionality when you save an Excel workbook in the Excel 97-2003 Workbook file format. The Compatibility Checker generates a report that provides a summary of the potential losses and the number of occurrences in the workbook. You can also specify what versions to show compatibility issues. Use the report information to determine what caused each message and for suggestions on how to change it. If the loss is due to a new feature in Excel 2013—such as new functions, custom layouts or Quick Styles applied to shapes, pictures, and WordArt—you might be able to simply remove the effect or feature. In other cases, you might not be able to do anything about it. To maintain a visual appearance, SmartArt graphics and other objects with new effects are converted to bitmaps to preserve their overall look and cannot be edited. 1. Click the File tab, and then click Info. 2. Click the Check For Issues button, and then click Check Compatibility. 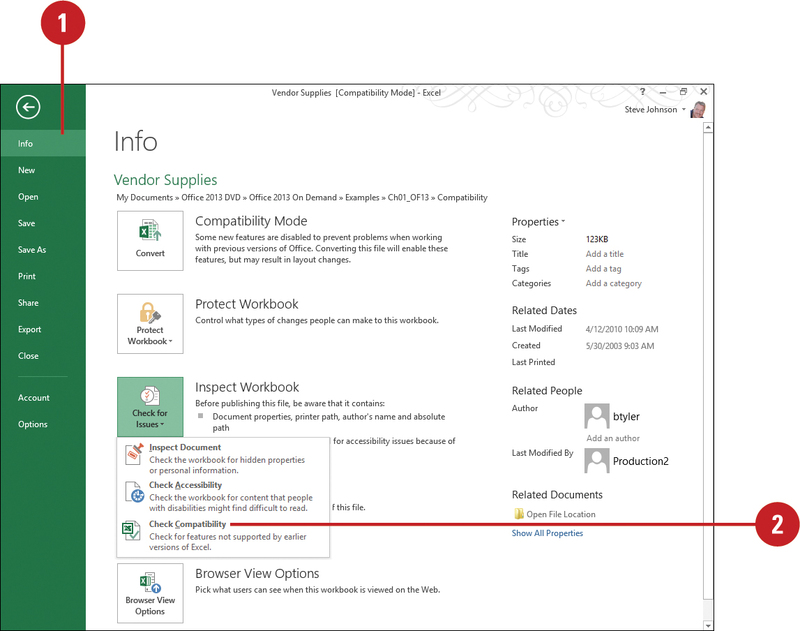 Excel checks compatibility of the workbook for non supported features in earlier versions of Excel. 3. Click the Select versions to show list arrow, and then select one or more versions to check. 4. View the compatibility summary information, so you can make changes, as necessary. 5. 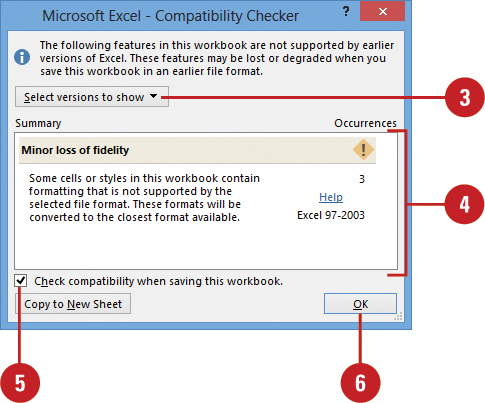 To have the compatibility checker check the workbook when Excel saves the file, select the Check compatibility when saving this workbook check box.